(9a) soul pleasure – walking forward. He’s hungry, he says. I realize slowly that I am as well. An idea begins to form, random bits and pieces from the fridge are coming together as I envision a finished product: satisfaction, delight. I giggle at my silly wonder upon opening the spice cupboard. My soul grins as I choose the voices for today’s choir (lunch). 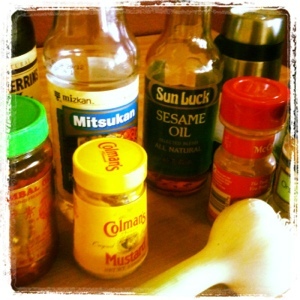 I’m not the kitchen’s Beethoven; I don’t know exactly what it will sound like in the end, so I just choose what I love and what calls to me today: Worcestershire, rice vinegar, sesame oil, soy sauce, ground mustard, cumin, cinnamon, fresh garlic…honey? I’m uncertain, but I’m not planning on creating a masterpiece, just moment of joy. As it turned out, it was all quite a hit. I loved feeding him. He loved being fed. And my soul delighted in the process. This entry was posted in Uncategorized and tagged food, smile. Bookmark the permalink.